It's located on 110, Creu Coberta Street, Hostafranc Metro Station, near the Espanya Square and it has a sales area of ? ?140 square metres. The facility is capable of accommodating 5,000 clothes for men, women and children as well as footwear, accessories and home textiles. Third, those looking for special and unique garments. 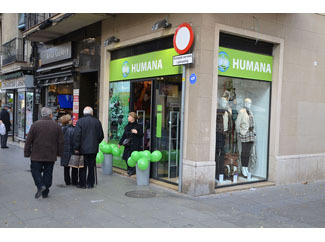 The resources obtained through the 31 stores Humana allow funding and implementation of development cooperation programs in Africa, Latin America and Asia. These programs are conducted in the fields of education, agriculture and rural development, community development, and infectious diseases and emergency assistance.